This time of year always gets a bit antsy for us, me especially. We find ourselves itching for spring, ready to get in the garden and to pack away all our wooly things until next the cold season. I am ready to wear long, floral skirts again without having the task that is pulling up tights. What a chore that is. February weather is always so peculiar and uneven in the Midwest. Sort of like my baking skills. One day it will be in the lower seventies outside, and the next, a high of freezing. Because of this unpredictability, the winter days can be rather long ones at home with kids, so I like to have a lot of craft ideas and activities on hand to keep us moving while adding more creativity to our days. I’ve pull some ideas from books, classes we’ve taken together, various things we do at art hour during our homeschool sessions, along with several things I’ve come up with on my own pulled from my college early education days. Go Panthers! What I most enjoy about this post is that these crafts and activities each engage a wide variety of the senses, making them fun ones for youngsters to try and stick with for awhile. I’ve linked as much as I can for you if needing tutorials or materials! 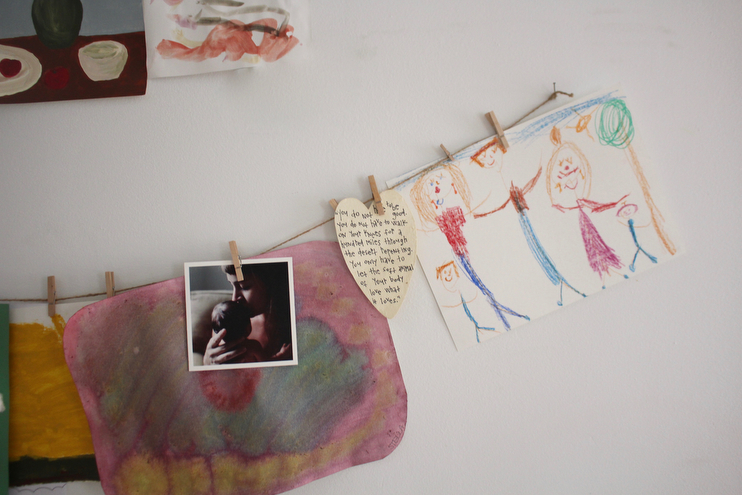 Watercolor Painting: I think this ranks as our number one go-to craft right now. We love turning on music (usually Raffi) and making beautiful pieces at the table together. One thing I really enjoy about watercolor painting is that it is age appropriate for each Alfie (1), Theo (3), and Stella (5). 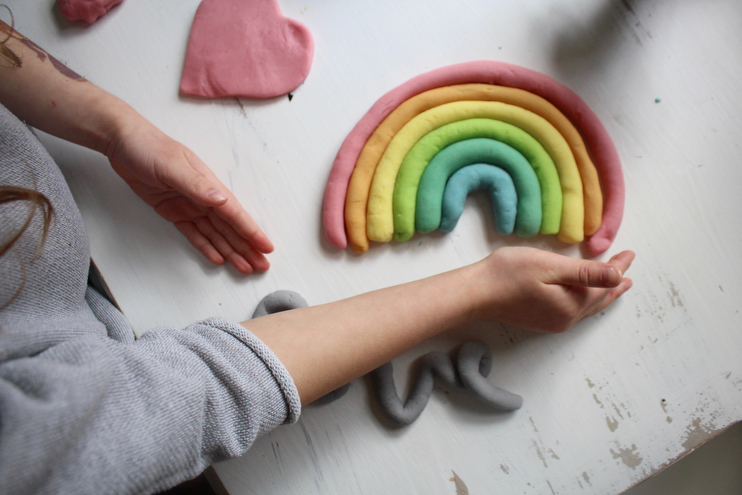 Homemade Play Dough: Once every few months we make our own batch of colorful play dough to dig into and play with. The kids love rolling it out and making designs with various cookie cutters I’ve collected over the years. This is another wonderful craft suited for different ages. Stella and I use play dough to work on letters while the boys do various things with their clay. 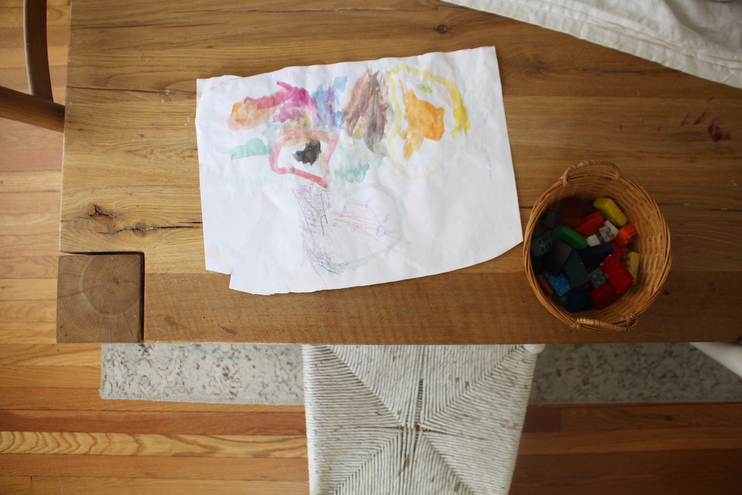 Beeswax Crayon Art: We love our beeswax crayons and they are perfect for little hands. Not to mention, they don’t roll off the table. Beeswax Modeling: Fill a big bowl with warm water, soak your beeswax for several minutes so it becomes soft, and have fun molding little creations with the kids. Waldorf Window Stars: These stars are a lovely craft to do in the winter time to add some color and light to your home. Bread Dough – Helping Mama: This is a wonderfully simple recipe to make with your little ones. Both Stella and Theo love getting their hands into the dough and flour when we make our loaves. Baking in the kitchen is a great way to practice math skills as well. Wool Felting: This craft is geared more toward older children, but you can make things alongside your bubs as they explore and make other art. I am working on felted hearts right now for Valentine’s Day. They are turning out really well and I can’t wait to show them to you! Brain Quest: We got Stella these cards several months ago to do in the car or when we are out and about and waiting…she loves them. I like that they are small and fold up, a nice activity to throw into a picnic bag or purse. Go Fish- Impressionist Artists: I picked these cards up at our local museum in their gift shop (a must-see if you are ever in KC!) and they are beautiful and fun. We do game nights usually once a week and play games in our living room without screens. It gives Andrew and I chance to connect with the kids and spend time together as a family without distraction. Close Up Card Game: This is another art-inspired card game I purchased at the museum gift shop along with a child’s magnifying glass. We use it to play eye-spy. Stencils: These are very similar to the same stencils I used and enjoyed at a young one. We take these with us when we go out to eat so the kids can make different pictures while we wait. Again, I love that they are small, open-ended, and invite creativity. DIY Telephone: Grab two tin cans, a long piece of string, a hammer and a nail to make an old-school play phone. A resourceful craft you can use from recycled materials! ABC Letter Cards: We love our ABC letter cards! They are beautiful and whimsical. Acrylic Painting: I can’t get enough of the Kid Made Modern section at Target, their acrylic paints included. These stain so be mindful of this if your kids are wearing something nice. I usually throw one of Andrew’s old work shirts on each of them, or an old apron, so we don’t ruin any of our clothing. Eye Spy: You don’t need anything at all but your eyes for this one! Bird Seed Feeders: We made these adorable little pine cone bird feeders about a month ago that our squirrels ended up getting ahold of and devouring. We dipped pine cones into sun butter and then into bird seed. I attached a string to the top and we tied them onto our pergola. Next time we pass the old pine trees on our walk I am going to scoop up more. We got such a kick out of watching those darn squirrels get their paws on the feeders. Beginning Sewing Kit: Stella got this knitting kit from Nana and Papa for Christmas but is still a bit too small for it. Perhaps this summer. Yarn Play: Give the kids a cheap ball of yarn and let them go nuts. Trust me. They will love this. Sand & Rock Box Play: Get a shallow bin and fill it with sand and rocks. Let the kids use it for dinosaur play or for their little trucks. This sensory activity is a fun one for Theodore right now. Finger Knitting: Stella is about to learn how to do this and I am excited to do it alongside her. Noodle Necklaces: Remember these? Let the kids paint noodles and then string them onto long pieces of yarn. These would be a nice little treat to tuck inside a card for a pen pal. Cotton Ball Art: Another oldie but a goodie. Using cotton balls, let the kids make snowmen, shapes, letters, hearts, whatever, with glue. Fruit & Vegetable Stamping: I always seem to forget how cool this is until we do it again! Cut various fruit and vegetables out (potatoes, celery, apples work well) and use them as stamps. Shadow Puppets: This is fun nighttime activity to do before bed. We had lots of fun last year making shadow puppets on our outdoor movie screen with the projector. Little One Yoga – Mirroring Mama: If the kids are wanting to move and you need to stretch, have them join in on a little yoga session with you! I will light some incense and a candle, turn on calming music, and let them stretch with me. Supper Prep in the Kitchen – Helping Mama: This is a great way to help your kids get interested in mealtime. Stella is my vegetable washer and peeler, Theodore is my mixer, and Aflie picks up the scraps and eats them. We make a good team. Chalk Art: Use a chalkboard or black construction paper with while chalk to make art. Sometimes simply switching up the materials you use on a daily basis to draw with can draw a lot of excitement for the kids. Fort Play: I highly encourage this on days that it’s too cold to go outside because it gets them moving. I’ll give the kids a stack of sheets and let them use any pillows from all over the house to make their magical fort. They usually spend more time making the darn thing then they actually spend playing in it. Hand & Finger Painting: Hand tracing and finger painting is a great sensory activity for little ones. Just be prepared for a mess. Water Bottle “Cleaning” – Helping mama: This one is fun. I picked up a few cheap spray bottles last year for the kids to use to help me “clean”. I’ll give them a rag and a spray bottle full of water and I let them wash things. They tend to stick to windows, walls, and the floor. It’s a great way to have them join in with our chores, while still having what they consider to be a lot of fun. Fork Painting: Gather paper plates, acrylic or finger paints, and few forks. Let the kids make fun shapes with the fork, a lion with a fork-painted mane is a favorite here. Friendship Bracelets: IKEA sells these wonderful beads that we make friendship bracelets with. It’s a wonderful way to help little ones with their fine motor skills while teaching them the beautiful gift of giving to others. Handmade gifts are the best, of course. Button & Yarn Necklaces: Like my grandmother, I never throw away old buttons. Instead, I use them for various things, necklaces being one of them. Stella likes to make these for her friends. Paper Snowflakes: Scissors are another great craft to help dexterity and fine motor skills. The kids love using them and making paper snowflakes out of coffee filters is a fun way to add pretty winter decor to our windows. Painting Rocks: Painting nature is a wonderful way to blend the indoors with the outdoors. It brings a sense of peace inside, but also gives the kids a chance to be creative with whatever they’ve collected. Wreath Making: A fun way to add beauty to your home with the help of little ones. Rock Salt Watercolor Painting: Cover a piece of watercolor paper with water and paint, and let the kids sprinkle rock salt on top. It will create a neat crystallization effect and once it dries, you can brush off the salt and see the beautiful bursts! I loved doing this in art class as a kid. Natural Dying Eggs: You don’t have to limit this fun craft to Easter time. If you eat a lot of hard-boiled eggs like we do, let the kids chip in and dye them for fun. Using natural dyes is much easier than you would think. I love the way beets turn them bright pink. Clothespin Dolls: Using old-fashioned clothespins and paint, you can make the most darling little dolls. This one made me chuckle. Wine Cork Stamping: Save your wine corks and make stamp art. Corks are never a shortage in this house, so this one is a a cheap and simple idea for us. The kids like stamping paper plates, making designs like flowers and patterns with the different colored paint. Pen Pal Letters: Stella is at the perfect age (5 years) to start sending pen pal letters. We have friends and family overseas and all over the country that we don’t get to see very often. Making art and sending letters with what’s going on in our world is a fun way to spend an afternoon. I let her write as much as she can, then she leads me as I continue writing down the things she wants to add. It’s really fun for me too. Legos: Those itty bitty legos are one of least favorite things we own (only because I’ve stepped on far to many to count) but because my kids are obsessed with them we do lots of Lego time. Because they are open-ended and invite creativity, there are so many things we make with them. Just make sure to dump them out on a large blanket first so clean up is not too overwhelming. Been there. Done that. Shape Sorting: Sometimes I’ll cut out several of the same shapes from different kinds of colored paper and mix them up. Theodore loves finding the matches and puts them into little piles. This is a good activity to take along in the car if you’ve got a long trip and it’s easy to make. Sound Maker: Cover one side of toilet paper roll or any other long, cylindrical tube with duct tape and let the kids fill it up on the other open end with different size pasta or beans. Tape up the other side, let them paint it, and you have personalized music maker. Shoe Box & Marble Painting: Get an old shoe box, acrylic paint, and a few marbles (or small wooden balls) and let the kids make abstract art. Dip the marbles in the paint and put them inside the box. Moving it around will create fun designs. Shaving Cream Fun: Remember when your teacher covered your desk in fluffy shaving cream and you practiced letters and shapes and numbers? I’ll never forget that day in 1st grade. Nature Collage: Have the kids collect bits of nature from a walk (when it’s warm enough to take one) and give them a large, study piece of paper with glue or tape. Have them make a creation using the things they found outdoors. “Hot” or “Cold” Game: I’ll hide five felt balls around one room and we play “hot” or “cold” when the kids get close to them. They love searching and finding. Lantern Making: This lantern idea is a fun one for older kids. Stella made several this year and they add warmth and color to our home. Rock Tic-Tac-Toe Game: I found this idea on Pinterest and think it’s darling. On our next outing I am going to keep an eye out for smooth rocks to make this with and sew a little bag of extra fabric to store our game. I think this would be a great addition to a diaper bag as well! Perfect for times when waiting is hard for little ones. Now I’m turning it over to you! What other indoor crafts or activities are you and your kids enjoying this season? Similar to using cotton balls, my son would glue colorful pompoms to paper forever. Usually he would use some kitchen supplies to play with the pompoms before glueing. He also loves to use the pompoms and play with our canning supplies. We like to make our own paint brushes with twigs, weeds, etc that we find on walks and tape or tie them on to sticks we find. My son loves to make treasure maps and we have to follow the map to find treasure “a hidden toy”. As I kid I used to like ‘tasting games’: one person puts some ingredients on a plate, like peanut butter, cinnamon, salt, honey, and the other has to guess what it is – blindfolded – by dipping a finger and tasting. I play memory card games and other card games with my 5 year old, and he also likes his marble run, building with special magnets (like SmartMax), he loves his jigsaw puzzles and of course Playmobile. With his daddy my son made papier mâché masks (by using a balloon), that they painted afterwards (as Iron Man ;-)). A bit of a messy craft but both loved it. Also fun: put a piece of paper (for crafting) in a baking dish, dip some marbles in finger paint or colored ink and let them roll over the paper by moving the dish back and forth and left and right. Oh sorry, you already had the shoe box and marble painting in your list. *Rainy days are fun (if it isn’t too cold!). We like to take leaves and watch them flow down the stream of water where the street meets the sidewalk. * card making station for friends/family/neighbors and deliver/mail them!